2015 Waste Management Phoenix Open Tournament Chairman Danny Calihan announced that Tony Finau and Justin Thomas received the last two sponsor exemptions for this week’s tournament at TPC Scottsdale. Padraig Harrington, Jon Rahm and Daniel Berger received the first three exemptions. A native of Salt Lake City, Tony Finau enters the field 24th in the FedExCup standings and 153rd on the Official World Golf Ranking. His 2014-15 PGA TOUR season already includes two Top-10 finishes (T7 Shriners Hospital for Children Open and T7 OHL Classic at Mayakoba) and four Top-25 outings in seven starts. He finished T59 last week at the Humana Challenge. On the 2013-14 Web.com Tour, Finau had 23 starts that included a win at the Stonebrae Classic, two T4s, a fifth-place finish, 14 Top-25s and only four missed cuts. In late June of last year, Finau made back-to-back eagles, including the 500th hole-in-one in Web.com Tour history, at the United Leasing Championship. Thomas has been impressive early in the 2014-15 PGA TOUR campaign, recording three Top-10s and four Top-25s in seven starts. He has placed in the Top-10 in his last two starts, finishing T6 at the Sony Open and T7 at last week’s Humana Challenge. He currently ranks 28th in the FedExCup standings and 88th in the Official World Golf Rankings. He turned in a stellar 2013-14 rookie year on the Web.com Tour. In 20 starts, the Louisville, Kentucky native notched one win at the Nationwide Children’s Hospital Championship, a runner-up showing, a third-place finish, a T4 and two T5s. Overall, he had 13 top-25s and missed only two cuts. Thomas’ performance stats were impressive as well, finishing No. 1 on Tour in the All-Around category, first in Birdie Average, third in Scoring Average and fifth in Driving Distance. Calihan and The Thunderbirds had a total of five exemptions to handout for the 2015 Waste Management Phoenix Open. The first exemption was given to Ireland’s Padraig Harrington, the second to ASU Junior Jon Rahm, and the final three to promising newcomers on TOUR – Daniel Berger, Tony Finau and Justin Thomas. The Waste Management Phoenix Open will be played January 26 – February 1, 2015, at TPC Scottsdale. 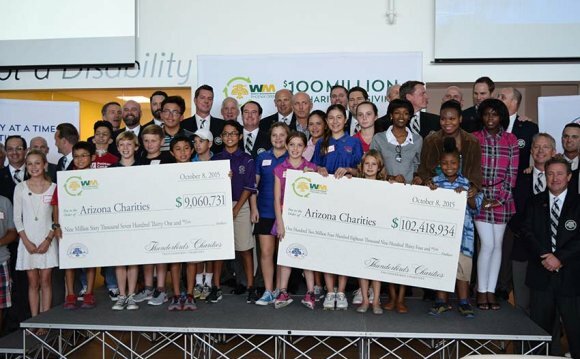 The tournament host The Thunderbirds have raised more than $93 million for charities, with more than $68 million generated since 2004. The 2015 edition will mark the 80th playing of the event, making it one of the five oldest events on the PGA TOUR (not including the major championships). For more information on the Waste Management Phoenix Open, visit wmphoenixopen.com.